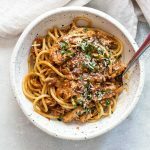 A ragu is a sauce that’s heavy on the meat and in this version, I used flavorful boneless skinless chicken thighs that cook with a few other ingredients in the Instant Pot. It’s a spicy bowl of comfort, so be sure to dial-back the red pepper flakes if you prefer a hint of heat instead of a big bite of it. I tossed the ragu with bucatini, but you could also serve it over rice or mashed potatoes. Combine the olive oil, tomatoes, balsamic, garlic, onion, parsley, thyme, and red pepper flakes in a 3-quart Instant Pot. Place the chicken thighs in the sauce and push them down so they are covered by the other ingredients. Lock the lid in place, close the steam vent, and select the high-pressure setting. Set the timer for eight minutes. It will take the pot some time to get to pressure and which point the sauce will cook for eight minutes. When the timer goes off, cover the steam vent with a towel (to protect your hand) and do a quick release. Once the steam has vented, open the pot and shred the chicken with two forks. If it’s easier, you can remove the chicken and shred it on a cutting board and place it back in the sauce. The sauce will be thin when you open the pot, but it will thicken as you shred the chicken. If you think your sauce is too thin you can turn on the saute setting and cook the sauce and chicken until some of the liquid evaporates. I own an Instant Pot Duo Mini 3-quart, which is the smallest size and great for cooking for one to two people. I have not tested this recipe in other models. Contrary to its name, an Instant Pot does not cook things instantly. Depending on what you’re making it takes time for the pot to get to the right pressure, so be sure to account for that extra time. In the case of this ragu, it took almost ten minutes for the pot to get to pressure which is still significantly less time if you made this recipe on the stovetop. Plus, there’s no need to babysit the sauce while it cooks. After I developed and tested the two-serving recipe, I made a double batch of the recipe using the same size Instant Pot. It worked, but the sauce did burn a bit on the bottom of the pot probably because there were more ingredients and it took longer for the pot to get to pressure. Always follow your manufacturer’s tips and recommendations regarding how much to cook in your pot and proceed with caution if you decide to double this recipe.